Look, there’s just something lovely about the scent of roses that I can't resist, it’s quintessentially English; it’s the black of my beauty wardrobe. If a product has a rose option that is the one I will pick first. I put roses on my body, in my hair, on my face, I drink it, and I spritz it all over so I come up smelling of roses every single day. Who doesn’t want to smell like flowers? I’m not talking that hideous overly floral scent that makes your nose crinkle from the assault; I’m talking about soft and gentle fragrances, a barely even there scent, a delicate touch. I’m very particular about my rose products, I favour “freshly cut” over “full English garden.” I want to smell like a flower not a stale bouquet. There’s something so dreamy about these flowers, I never tire of their smell. Every time I discover a new rose scented something I am all like, “oooh ROSES” like I’ve never smelled roses before in my life. I have an entire wish list devoted to rose related products, that’s how seriously I take roses. I don’t know whether it was my grandmother’s rose garden, epic in size and requiring a garden plan to keep track of the varieties and where they could be found. Or maybe it was the part in Disney’s Alice in Wonderland where all the flowers sing. Who knows where this obsession came from? I understand if you’re not into it though, I mean, you’re wrong and you need to learn to love it but I get that your favourite scent might be different from mine. So what’s the one fragrance you can’t live without? I so want to try that NUXE mask! As of late I'm totally addicted to lavender. I just want to roll around in a lavender field and smell of it forever. Mmmm. do you have an all time favourite rose scented product? i don't know if i have a favourite smell, actually. i'm very fond of roses too, but i do love subtle lemon/oranges smell as well as rosemary, but rosemary is just really nostalgic ..i don't know if there are many rosemary scented products? is that even a thing? I used to really dislike rose anything, but since I've started using some Botanics and Una Brennan skincare it's definitely grown on me! Tea tree and mint are both so fresh smelling. I really like the mask but I'm right now I'm battling with the idea that it MIGHT be responsible for breaking me out. Lavender is really hit and miss with me.. sometimes I like it, sometimes I hate it. I hated rose scented products when I was younger. I always thought that they were for old ladies, until I started working where I've worked for the past two years and we have a product that is a blend of rose, neroli, clary sage, and geranium essential oils. By the way, is it just me or do frosted glass jars make everything look just that much more lovely? Dang it, Nuxe! I used to adore rose scents, but I've come to be quite particular. As I try to ignore the fact that we can't get Una Brennan in the states, The Body Shop's Moroccan Rose line smells amazing! YES that face wash is wicked. I'm really picky with the rose scented things I pick up. I find the more expensive products smell a lot more like actual roses than the cheap ones.. 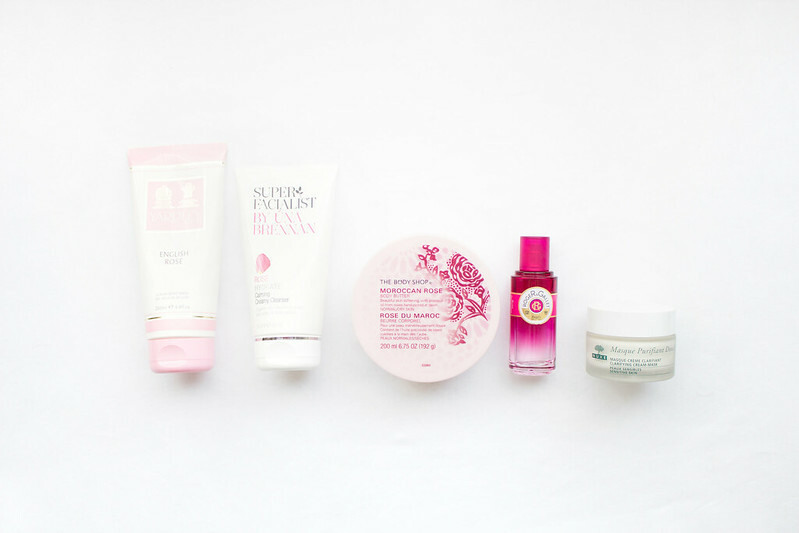 I haven't actually used the Rose body butter yet, I'm totally into body oils right now. BOO to not getting Una Brennan in the states, that stuff is amazing. YES I want everything in frosted glass. I think you have to be real picky about which rose scented products you buy, some of them smell nasty.